For me October is when things really start to feel like fall. So for today's Moodboard Monday I did a roundup of items that would make a cozy, neutral fall table setting. The great part is, other than the pumpkin, these items can be used all year round and even easily transition to Christmas. 1. Eucalyptus Garland - Y'all know I love eucalyptus! This is a great faux option. I would use this as a centerpiece for the table and weave it through some white pumpkins of all different sizes. 2. Large & Small candlesticks - These are great for anywhere and anytime of year. They're a good staple decor item to have around. I would use them grouped together in the center of the table, mixed in with the eucalyptus and white pumpkins I mentioned above. I would do an odd number, three small and two large. You could line them up in a row or disperse them randomly. 3. Wood Chargers - I love using organic materials anytime of year, but especially during the fall! These would add the perfect natural element to the table. 5. Gold Flatware - Gold Flatware is another home decor staple. It's perfect for anytime of year, but adds some nice warmth in the fall. 6. 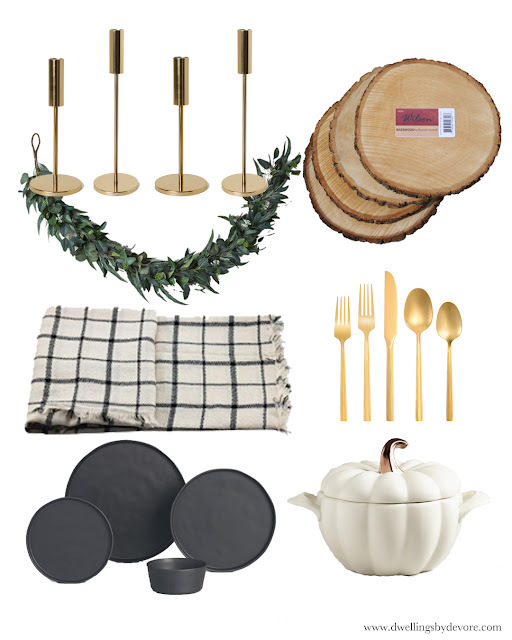 Black Dinnerware - I don't know why, but black screams fall to me. I love the depth it would add to this table setting. 7. White Pumpkin Baker - We make a lot of soup this time of year and I think it would be so fun to serve it in this!